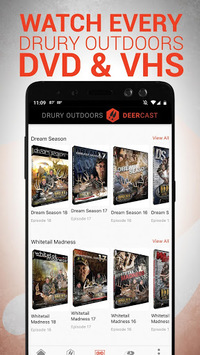 Get ahead of your game by harnessing over seventy years of Mark and Terry Drury’s whitetail hunting expertise along with hour by hour real-time, algorithm-driven deer movement forecasts for your precise location with the new Drury Outdoors DeerCast app. 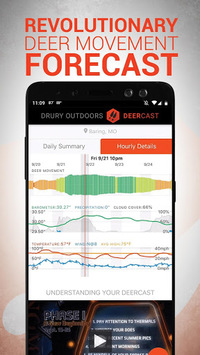 DeerCast combines your local weather information with the distinct characteristics of each of the THIRTEEN phases of whitetail season to deliver a custom forecast for peak deer activity where you hunt. Down to the hour, on whatever piece of ground you specify, this groundbreaking algorithm interprets 11 key conditions that Mark and Terry have identified as crucial to deer movement. They’ve cracked the code for deer movement and exported it from their heads and into this app to help you become a better hunter. DeerCast is also your hub for Mossy Oak & DODTV content, a hefty collection logging in over 20,000 minutes of adrenaline-fueled hunt footage. 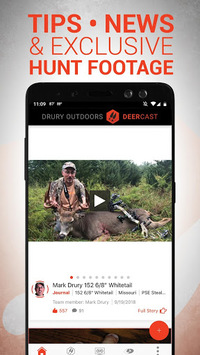 The Mossy Oak team is joining forces with Drury Outdoors to deliver content in the news feed portion of the app. For the first time ever, watch the DOD team’s actual hunts and see video of buck kills as they happen during the season. Interact with DOD team members in ways like never before and submit photos from your hunts that could be featured on Drury Outdoors social media! Get educated with more in-depth, how-to content than ever before and be entertained with every shred of DODTV at your fingertips, including exclusive content only on the app. If that weren’t enough, we’re also giving you complete access to the Drury Outdoors video vault. Watch titles all the way back to 1989 with access to the entire DOD video library.